Allegro MicroSystems: The new A1369 from Allegro MicroSystems Europe is a customer-programmable, high-accuracy linear Hall-effect-based current sensor IC packaged in a slimline 3-pin single-inline package which allows for easy integration with a magnetic core to create a highly accurate current sensing module. The A1369 is designed for use with customer-provided steel or other ferromagnetic cores, where its programmable nature allows it to compensate for manufacturing tolerances in the final current sensing module assembly. The accuracy of the device is enhanced by the programmability of both the sensitivity and the quiescent output voltage (QVO - the output with no magnetic field present) on the output pin for end-of-line optimisation without the added complexity and cost of a fully programmable sensor. The device features one-time programming using non-volatile memory to store the desired sensitivity and QVO for a given application or circuit. Allegro programs the sensitivity temperature coefficient and QVO temperature coefficient during end-of-line testing to minimise programming requirements for the customer. The A1369 is a ratiometric Hall effect sensor IC that provides a voltage output that is proportional to the applied magnetic field. The quiescent voltage output is user adjustable around 50% of the supply voltage, and the output sensitivity is programmable within a range of 8.5 mV/G to 12.5 mV/G for the A1369-10 and 22 mV/G to 26 mV/G for the A1369-24. The features of this linear device make it ideal for use in industrial applications requiring high accuracy and a guaranteed wide temperature range of –40°C to +85°C. 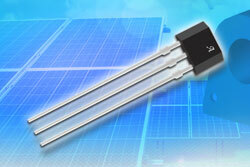 Current-sensing modules using the A1369 can be used in a variety of applications including electric power distribution and solar and wind power applications. The A1369 is available in a through-hole single in-line package (TO-92).